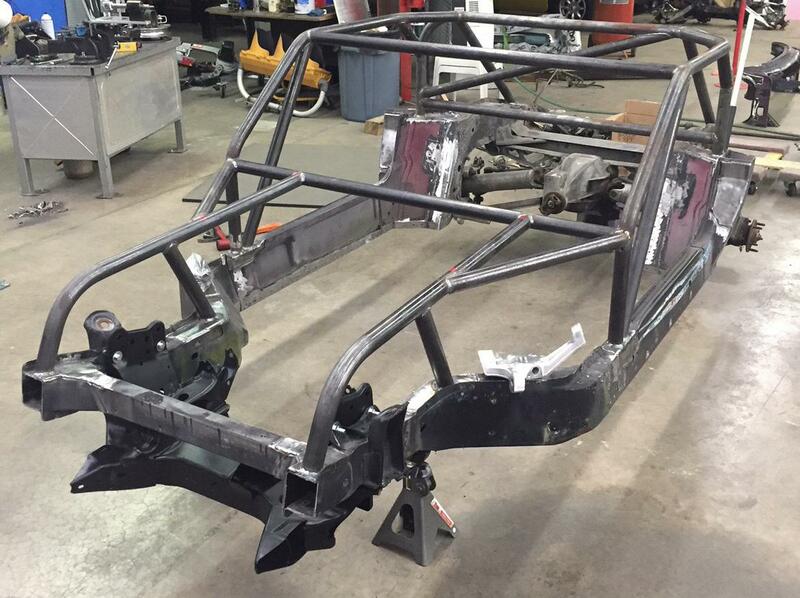 Forums » Builds and Project Cars » I know, another copycat Corvette Kart build. So I have no imagination. Fine. So I’m easily amused by things that I see on the interwebs. Fine. 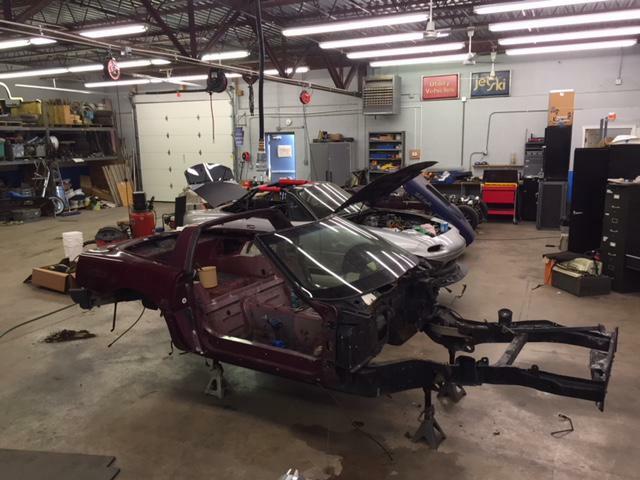 I have a 1990 Corvette that’s hit in the front and a 1993 Anniversary Edition chassis sitting here. What’s a guy to do with them? Copy what has seemed to work for others and build another toy. So here’s the back story. Along time ago I purchased the 1990 from a friend of a friend who had recently crashed it. 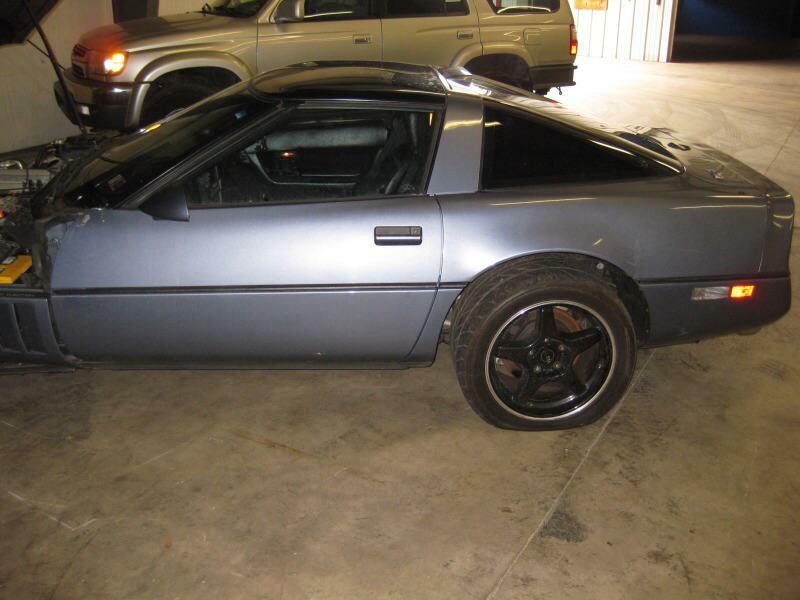 I’m not a Corvette guy, so I figured I would either part the car out or sell it as is and try to make a few dollars. In talking with a friend, he expressed an interest in the car and we were going to do some haggling over what I would get in return. He had a Corvette Grand Sport replica chassis that I wanted and he was going to trade me the both Corvettes plus $$$$ for it as a rolling chassis. So, I trailer ed everything out to his shop in knowing the way he works, figured I wouldn’t see anything for several months. Well, life got in the way(new house, family illness, new shop) and several months turned into several years. I ended up going to his shop and retrieving everything after we found the project was never going to go anywhere . Upon getting everything back to my shop, I saw how much the good car had deteriorated over time just sitting closed up outside. 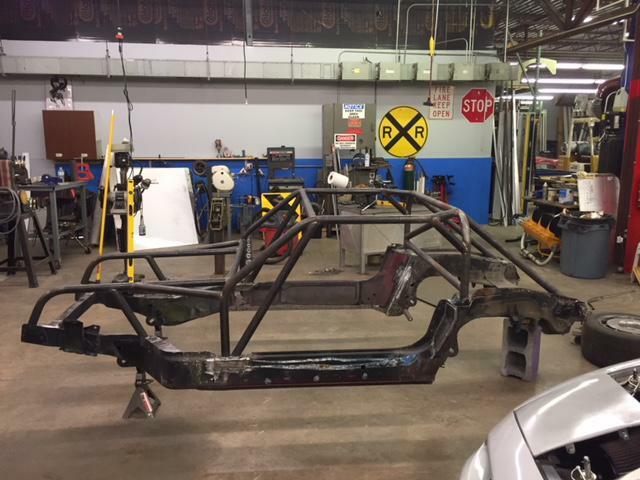 Now I had some decisions to make, what to do with an old C-4 Corvette and a bare chassis? Again, part it out but C-4’s don’t bring any $$$. 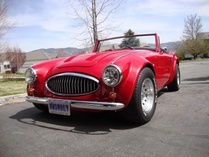 Build one of the numerous kit cars on the market using the donor parts? The current trend is that there are numerous people that have built Corvette karts and seem to be having a lot of inexpensive fun, so why not ex-lore that route? I did some calculating and I figured for a couple of grand I could easily complete one, so here it goes........... It certainly will not be a quick build as life always seems to get in the way, but all I will update it as often as I can. It won’t be fancy with turbos or superchargers, just a normally aspirated toy using as much of the donor car as possible. In true GRM fashion, I will be parting out the unused parts from the donor to recoup some of the initial investment. A few pics for now of the donor car and chassis. More to follow tonite. If you're on Facebook, join the group Vette Hack. Tons of us there that share info/designs. Great. Another Rabbit Hole for me to fall into. How long before someone starts a class or spec series for Vette Karts? welcome aboard! i am (now) suffering from shop envy. Definitely join the aforementioned FB group, good and knowledgeable group. Most of them used C4(es) so you can surely get quick answers to any questions you might come up with there! OK, had some friends come over and help lift the chassis off of the frame table and move it over to an empty workspace. 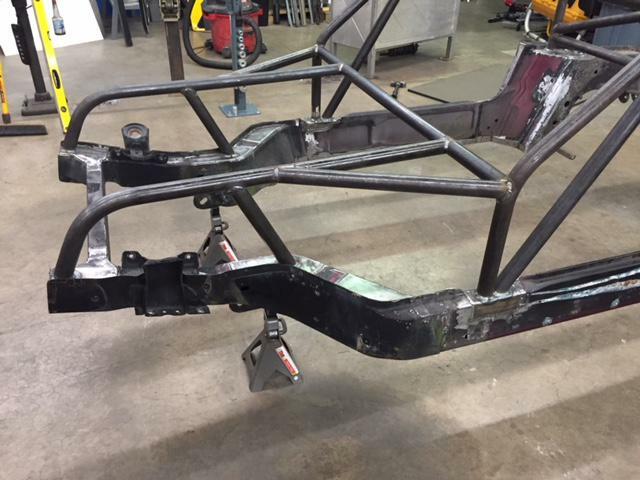 The main portion of the cage/chassis fabrication is finished to the point that I no longer need it on a level surface. I have a 1985 C4 that I was going to convert into a Kart. But, I only have the energy for one build right now so I'm going to sell it and concentrate on my Cheetah inspired build. Ok, so my last post got cut short for some reason. 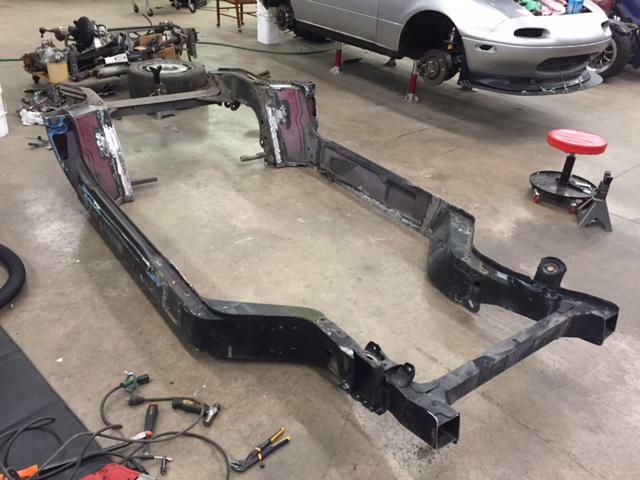 I had some friends come over to help move the chassis from the frame table since the bulk of the rollcage fabrication is done. They were a bit surprised to see what had come of the Anniversary Corvette chassis! I decided not to follow what most others have done in their kart builds. I tend to do things a bit different and this is no exception. You’ll see shortly. 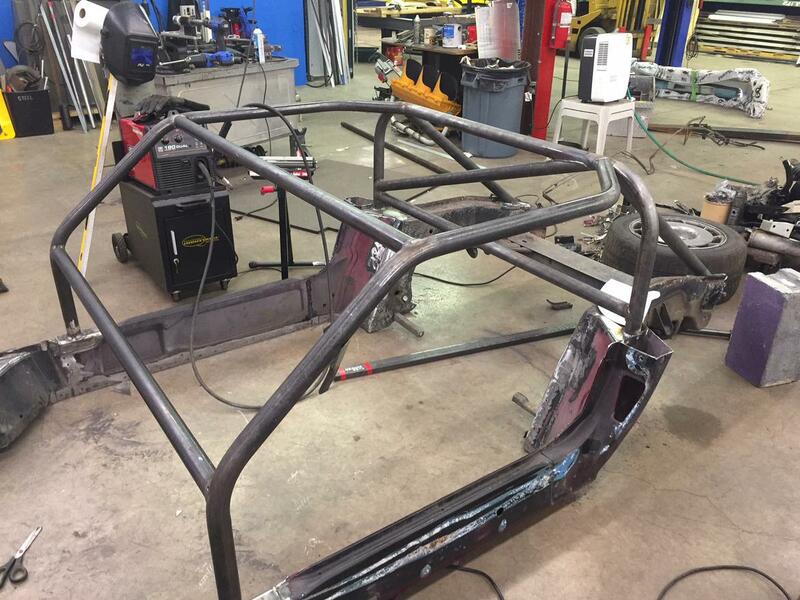 First the windshield was removed because it’s always easier to weld in a cage without it there. Next I took a good look at the firewall and noticed that it was fiberglass. Also the front 1/2 of the floorboards and transmission tunnel were fiberglass as well. I wasn’t crazy about them, so they were cut out. 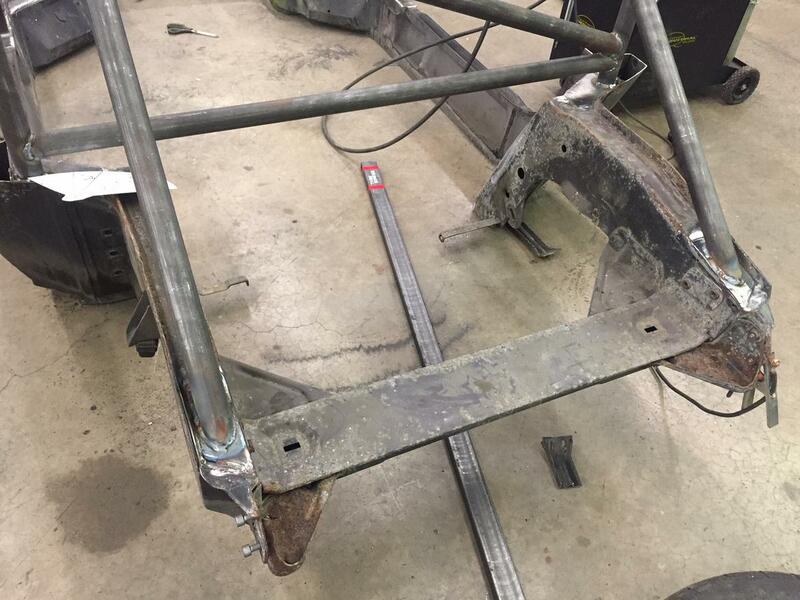 The rear floorboards and bulkhead were sheetmetal, but since the front floors were going to need to be fabricated, why not just make everything the same. You guessed it, out with all the floors! 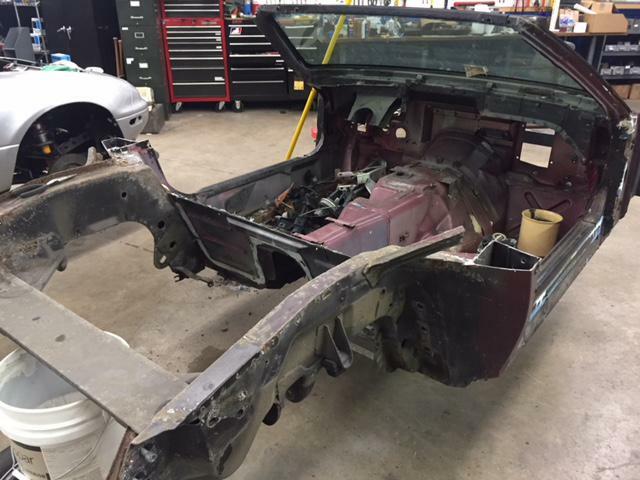 Now the windshield frame, cowl and door jamb piece looked out of place. Since it’s really only held in by two dozen spotwelds, out came the spotweld cutter and in 1/2 an hour it was neatly removed. This thing just keeps getting lighter! Now the only thing left was the “targa band”. Well, care to guess what happened next? Yep, sawzall it off!!! Pretty soon after a bunch of grinding, all that was left was the perimeter frame. I like most kart builds. In to follow this one. 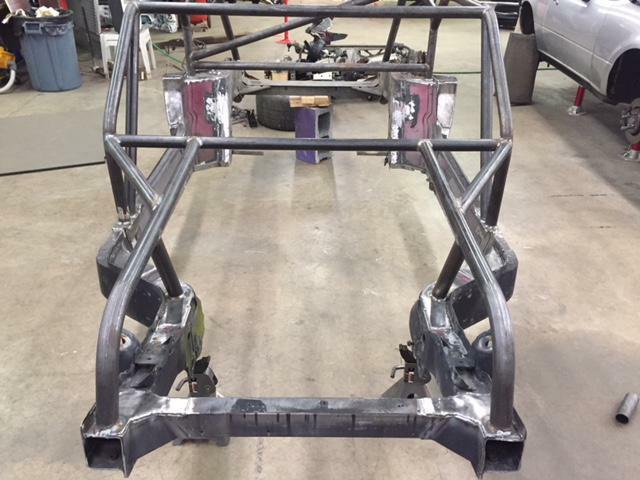 This all happened over this past week, but here are some more pix of the rollcage fabrication. All tubing is 1.75” x 0.095” DOM so it will be legal for any SCCA or NASA class that it will eventually fit into. There will be doorbars, but I won’t install them or any additional chassis bracing until the interior metalwork is completed. Thank You sir. It’s going to be a L-O-N-G term build but should be fun. I have too many other projects that need to get finished and sold, but I will pick away at this one whenever I get free time. The good part about this that I only needed to replace the engine cradle, left front spindle and left rear tie rod. It should be easy to bolt-on all of the suspension to make it a roller but I won’t do any of that because it needs to go back on the frame table to do the floor, tunnel, rear bulkhead and firewall. I will compile parts and keep plugging away. wow! 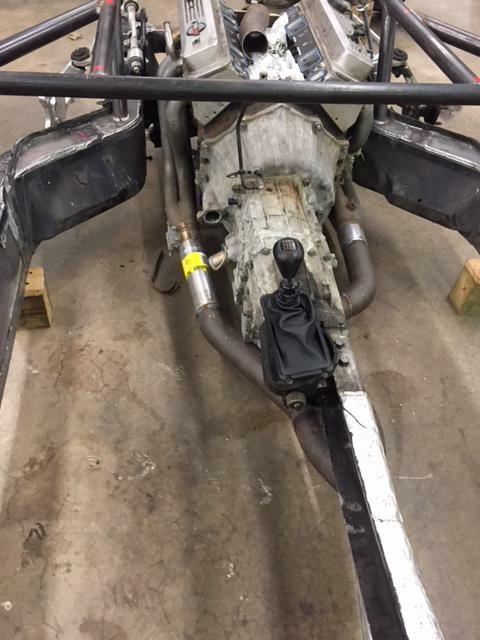 that is definitely the most stripped down vette kart build i have seen. 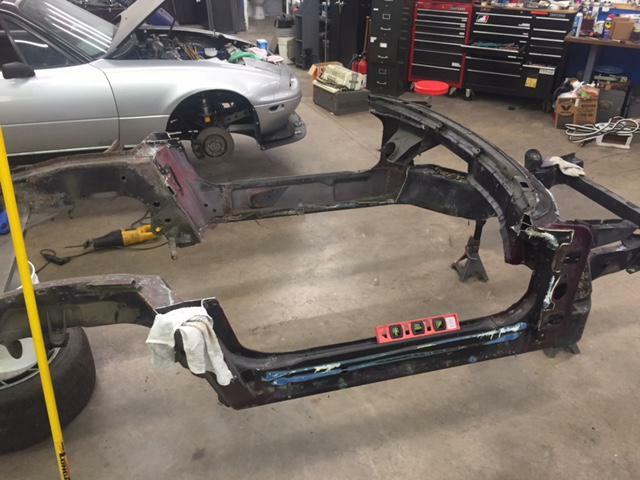 I stripped everything down to get to the bare frame. Obviously! It will be easier to put tubing where I want it rather than having to settle for installing tubes around “stuff”. I also want the driver as far back as possible, so this allows me to put the pedal assembly and steering where they need to go once the seat position has been determined. Basically it’s like building an asphalt or dirt circle track car from a bare Monte Carlo chassis as a friend reminded me. reckon so. since you have that advantage, i would try and shift as much weight rear as possible! That's an awesome start! Looking forward to see what you do with it. DAYUM. YOU. DO. NOT. PLAY. AROUND. 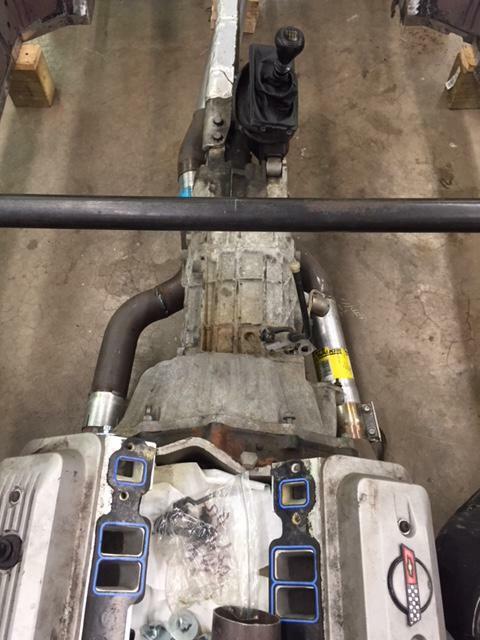 I was able to pick up an engine cradle and left front spindle today. 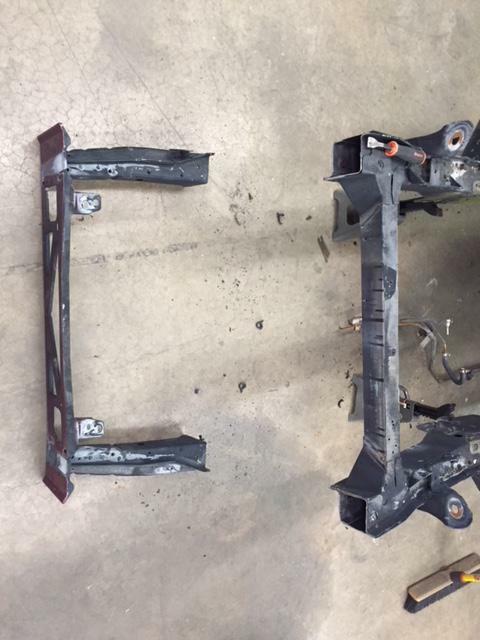 These were the 2 major parts that were damaged on the donor car and unuseable for the kart build. Hopefully with those 2 pieces, I can get it to a rolling state tomorrow. If so, I’ll install the motor, trans and PPF and contemplate my next move. I’m thinking of moving the engine back a few inches to help with weight distribution. Any thoughts? 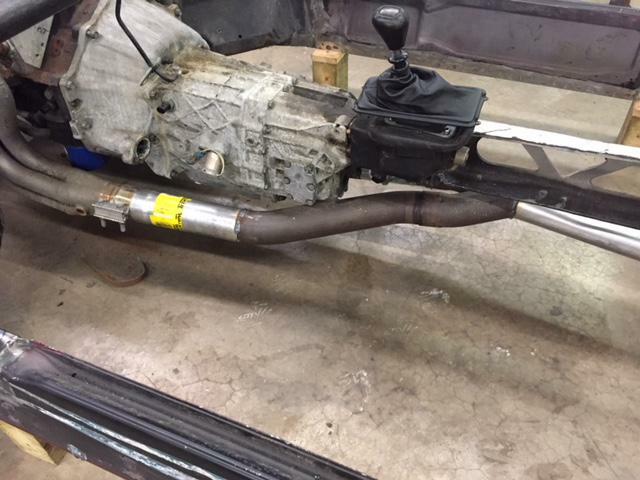 I don’t have to install the driveshaft and PPF, I can just shift the motor back and throw it on scales to see if it makes enough of a difference to go through all of the effort. I’m bored tonite and thinking out loud(and typing). 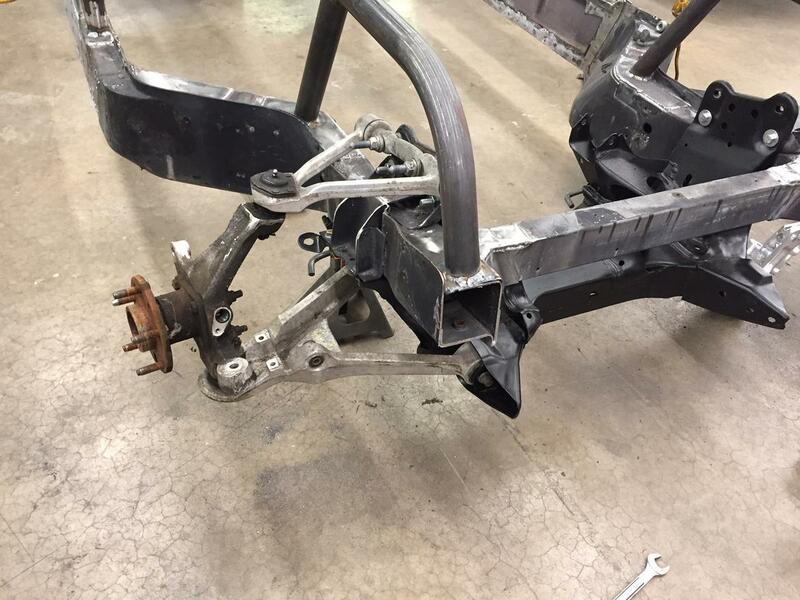 I had some free time at the end of the day and threw the rear suspension under the chassis because I wanted to get it to the point where I could roll it around the shop. It was when I got to the front end that I recalled how much you were limited in lowering the front end of these cars because of the damn leaf spring. 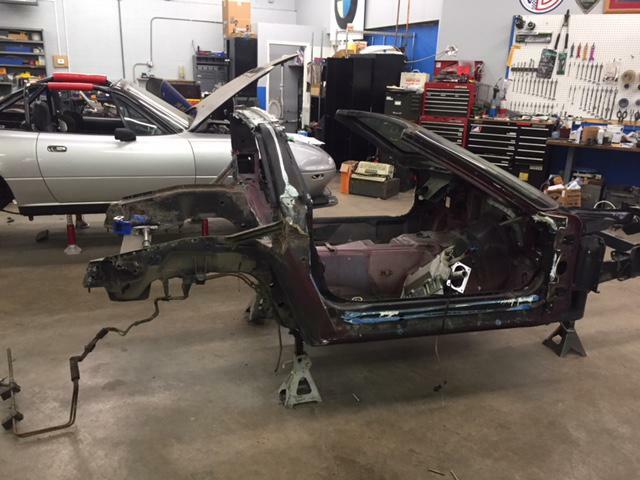 Back in the Corvette Challenge days, we could get the car a little over an inch lower, but that’s not going to be enough for this build. Years later, we had an SCCA ITE, x-Challenge car that we converted to front coil overs and that set-up worked very well. I put the a-arms on and took a look at how much space was available where the stock shock mounts. I was deep in thought when I remembered that 2 spaces over in the shop sits my fathers Lotus 7 which just so happens to have a set of QA-1 coilovers on it. So, I jacked it up and removed a front one to see if there was any chance it would fit on the Corvette chassis. Holding it in place, it looked like it would work. It was going to be tight, but then looking at the upper mount, it would fit better if that weren’t there. Well, I have a saw-z-all and a grinder and half an hour later, both upper mounts were removed from the chassis and ground clean. 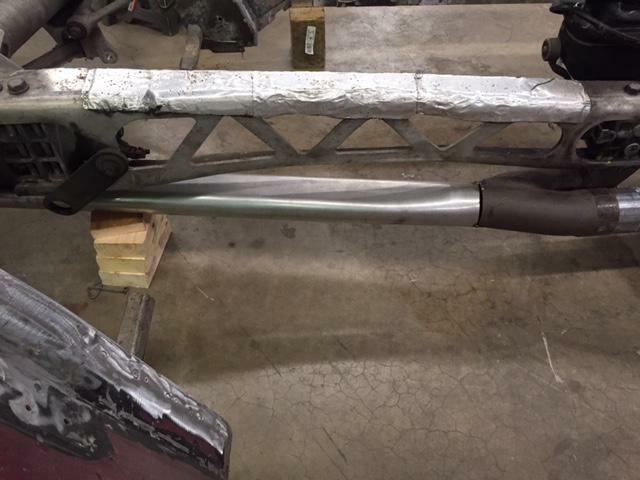 Now, holding the shock in place, you can see that a mount welded to the newly installed chassis tube is the natural place for the upper mount to go. I ran out of time for the week, but next week should be fun. 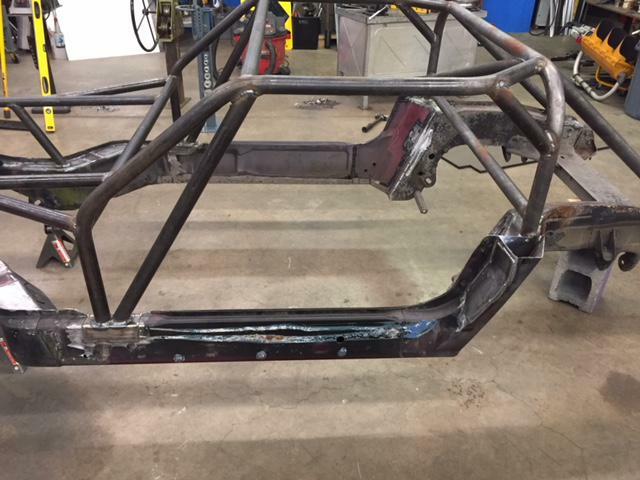 I will set the chassis at static ride height(5 to 5-1/2” at the pinch weld), figure the height of the front tire, position the upper shock mount and that will tell me the compressed and extended length of the shock that will work. Some info on the driveline to follow. GOOD stuff! When I had my 85 I wanted to move the upper a-arm mounts inboard & rearward slightly to give it better camber & caster, which it drastically needed. Lots of building repairs over the last few weeks with all this rain, but I was able to steal a few hours in the shop and work on the cart. 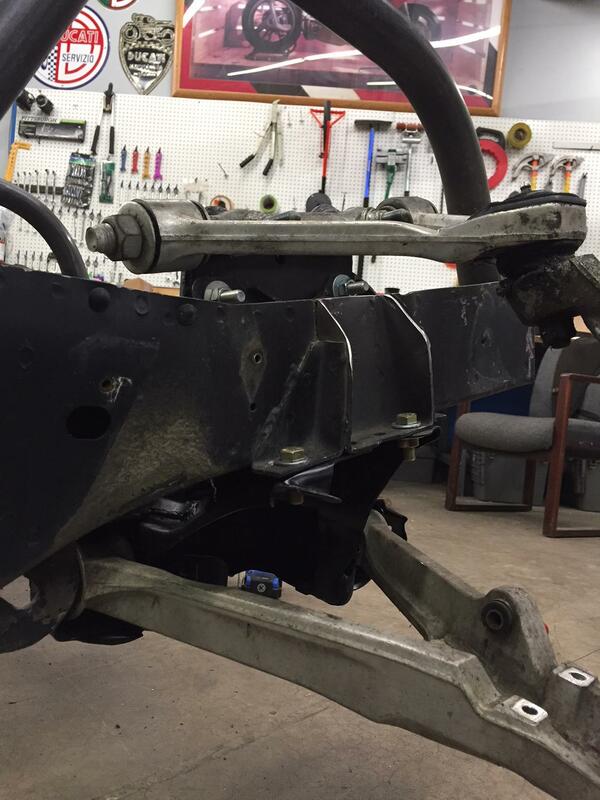 Since the front and rear suspension are all under the chassis, it was time to throw the driveline in. Now the engine, transmission and PPF are all bolted in place. 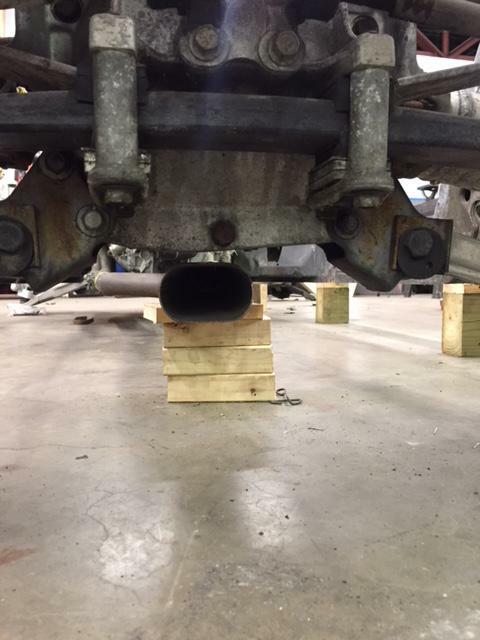 Then the headers got put on so that I can figure out what type of exhaust system to run on the car. Here’s what I can use some help from all of you. Any exhaust guru’s on here? 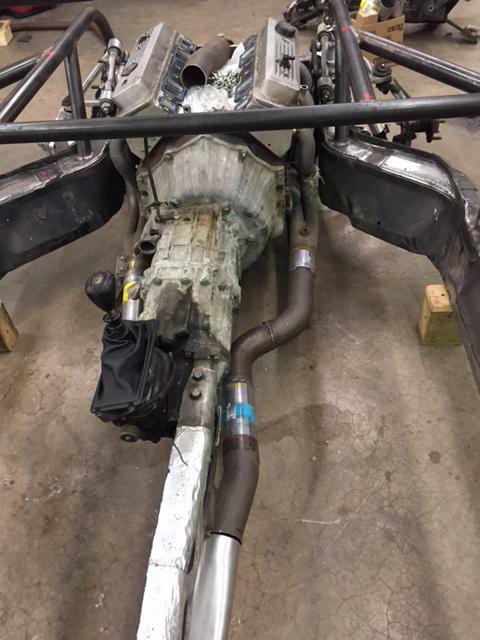 The headers are long-tube, 1-5/8” primaries and finish into 3” collectors. I’m not sure where to go from here. Sidepipes? True duals? X-pipe to duals? Y-pipe to single exit? I pulled out a bin full of exhaust pieces/cut-offs and threw/tacked together a quick Y-Pipe/single exit system, but I’m not sure what size pipe is needed after the “Y”. 3”, 3-1/2”, 4”? I have a piece of oval 3” but it looks so small. I would like to build a system that would support any future engine upgrades to 500 HP or so. Any and all advise is greatly appreciated.